In this trickster tale from Africa, Anansi proves to Elephant and Killer Whale that in a battle of wits, brains definitely outdo brawn. Anansi stories are always interesting because the clever spider trickster is always landing in some kind of adventure or trouble...many time of his own greedy, impulsive design. 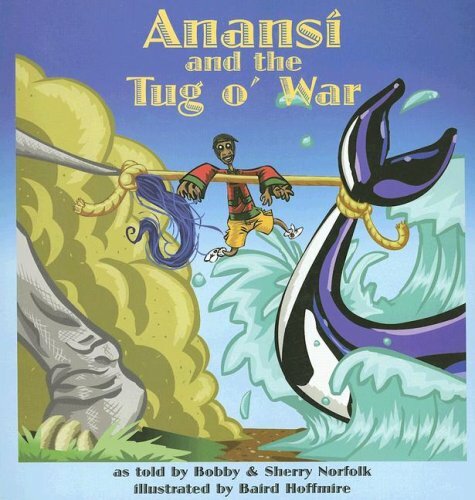 Bobby & Sherry Norfolk offer several Anansi stories that are full of humor and important character-building lessons. This book follows that same tried and true pattern. If your child has a vivid imagination and a sense of humor, he / she would probably enjoy this cause and effect story where Anansi actually wins the day by succeeding in his trickery: convincing two very large animals that he, a little spider, is stronger than they are. Educationally, the tale presents themes about consideration, pride, boasting, overconfidence, respect, listening, and the Virtue of the Small. This book is worth reading to and discussing with children. The story illustrates the fact that sometimes brains can win over brawn. The companion websites from August House & StoryCove are enjoyable for young people as well.